It happened at a picnic, while talking about whether or not a salad of tomatoes, peaches, and mozzarella, was a new idea. Peter said it was. I said not. Which is the usual childish direction our conversations go -- "No-ooo!" "Yes!" "Never!" "Wrong!" 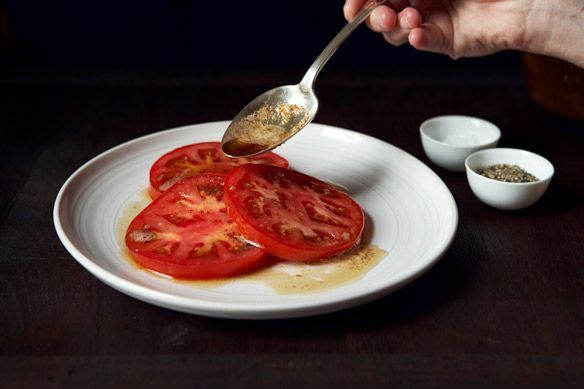 Peter wisely changed the subject to an even newer tomato concept he'd recently encountered at Lulu & Po: sliced fresh tomatoes, dappled with brown butter, salt, and pepper. He had me (for once!) 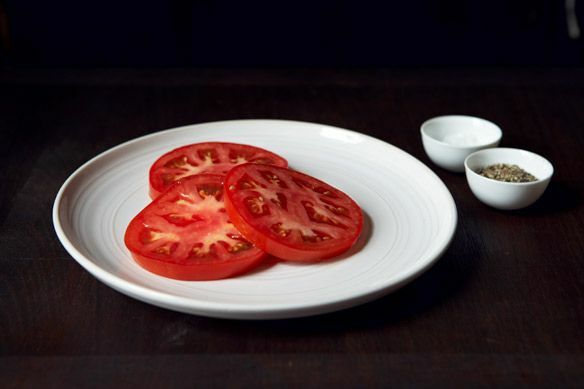 -- I'd never heard of brown butter tomatoes. How can you resist something called Brown Butter Tomatoes? I had to try them, which I did at our last photo shoot. You won't believe how easy they are, how close you are to summertime bliss just reading these words. Start walking to your kitchen. Slice a tomato. Beefsteak is best. One-third inch thick slices -- half-inch is too thick, one-quarter is too thin. Get out your ruler if you must. Overlap the slices on the plate you'll devour them from. Brown the butter and grab a spoon. As you spoon the butter over the tomatoes, listen: they sizzle! Shower them with a flaky salt, grind over some pepper. And have at them. As Merrill noted, the tomatoes and butter together are mysteriously, deliciously reminiscent of lobster with melted butter. The richness. The sweet, tender flesh. The exquisite burst of summer. Tried this out for lunch today - the tomatoes are important, but you definitely have to get the sizzle so don't overlap the tomatoes too much. Tasted really great - a new standard around our house. 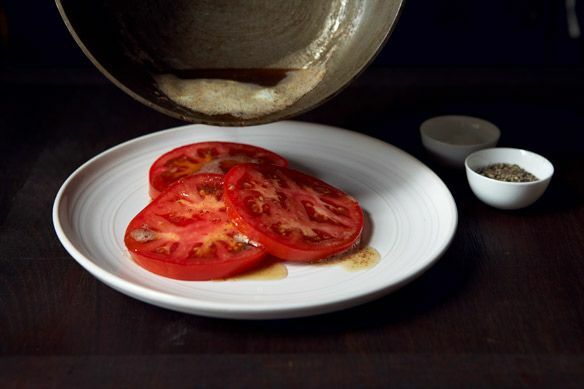 The acidity of the tomato played off the sweetness of the browned butter so nicely. Then we mopped up of those juices with the bread - wonderful! Making these for breakfast today with the 'poached and scrambled' eggs from Daniel Patterson. I have re-christened them 'cloud omelettes' for my niece and nephew! Two questions. 1. Did the butter sizzle as it was spooned over the tomatoes? Because this is important -- this is where the melding happens because the butter cooks with the tomato juices and creates a delicious "sauce". 2. Did you use flaky sea salt? 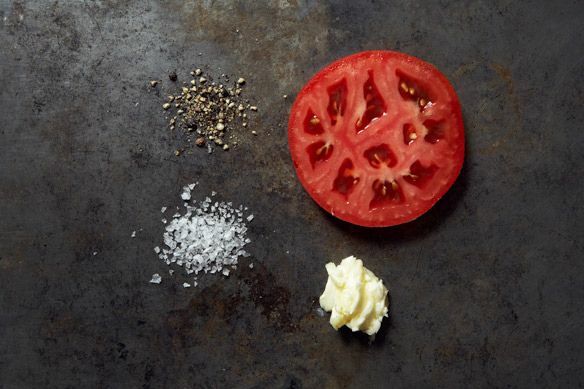 Salt is really key to highlighting the sweetness of the tomatoes and the nuttiness of the butter. Hope you'll give them another try sometime! For lunches lately, I've been eating fresh ricotta topped with halved sungold cherry tomatoes, sliced peaches, olive oil, salt and pepper. *Really* good! I had seen the teaser for this without yet reading the article. Last night we made a salt crusted snapper and had a pile of red, green and orange cherry tomatoes and the notion of brown butter surfaced though I did not have access to look up the recipe. We simply browned some butter, stirred in a slight bit of sherry vinegar and sprinkled salt, pepper and basil on top. It was a perfect companion to the fish. Delish! This sounds so good -- and wish I'd seen your comment earlier because my husband made fish the other night and topped it with chopped tomato salad (our default fish accompaniment this time of year). Would have liked to try this. Next time! Oh, I love tomatoes served this way! The real flavors of a fresh vine ripened one are so good! Goodness, this is delicious! It's easily a new favorite way to eat tomatoes. So heavenly. Thank you! Glad it was a success -- I've now made this a bunch of times. World's easiest first course dish! Read this and headed straight out for tomatoes. Totally simple and delicious! Our tomatoes were room temp but after a while the butter still congealed, so definitely serve these right away. In fact, I'd have the tomatoes ready on the table and drizzle on the butter as part of the presentation--the sizzle is pretty cool after all. Good point -- could also warm the plates. I feel a fool for not having thought about this myself. My favorite sauce is beurre meuniere - at least the one I made as an apprentice: brown butter, tomato concasse, garlic, capers,salt & pepper and sometimes almonds...mmmmmmm! The French brown butter sauces are all so good. And tomatoes concasse are always great -- tho I'm too lazy to make them these days. I love brown butter. I make a dish with brown rice. lump crab meat and brown butter which is delectable. So simple, so rich, so satisfying. I might have to make that this evening for dinner. There's also lobster roll made with just lobster meat and browned butter. Yum! A genius recipe if there ever was one. Had this for lunch today on whole grain toast with a side salad. A better BBLT (brown butter lettuce and tomato, obv) there is not. Amanda, you published a recipe -- a sort of non-recipe, actually -- of a pasta dish friends made on a Friday night out in the Hamptons. I've been making it ever since. As I remember it (and make it), it's creme fraiche, lemon zest, lemon juice, arugula, and Parm, topped with long pasta. Yes, I seem to be perfecting my non-recipe repertoire these days. I have another non-recipe coming soon (hint: dessert!). Glad you like that pasta -- it's a keeper. Wow! I'm making this for lunch today...I have beautiful Beefsteaks ready to be picked!